The new Maxima RED is a breakthrough in controlling Dynamic Spine. Football aficionados know the significance of the red zone. It’s the most important part of the football field. Control the red zone and you control the game. Unlike a football field, the most critical part of an arrow shaft is in the middle. That’s why the folks at Carbon Express refer to the middle of their new Maxima RED arrows as the “RED ZONE.” And they’ve figured out a way to manage dynamic arrow spine there, and put you in control of the game. The nock, shaft and broadhead represent something of a “holey” trinity of bowhunting, holey in this case referring to how close you come to putting successive arrows in the same hole. The more you control these variables, the better you shoot, and the whole becomes greater than the sum of its parts. And it’s probably fair to say that of the three, the shaft is the most important variable. Consistency is the ultimate goal of those who shoot, and make arrows. Greater consistency in materials and construction produces greater consistency in results, which is essentially the definition of precision. It also leads to increased accuracy. The Carbon Express design and engineering team has always gone to great lengths to ensure their arrows are consistent, and as a result, your shooting is more accurate. They use some of the most sophisticated equipment in the industry for manufacturing and testing their arrows for straightness, weight and static spine (the relative stiffness of a shaft). Tighter tolerances in all three produce greater precision and accuracy. In short, you shoot better. It is sometimes said, in sports and in business that getting to the top is tough, but staying there is tougher. Carbon Express has long held a position among the leaders in terms of arrow straightness and weight consistency, but they’ve never been content to rest on their laurels. Still unsatisfied with the results, they recently decided it was time to look elsewhere, at dynamic spine, to build a better arrow. If there’s a holy trinity, there’s also an “un-holey” trinity of arrow performance: Archer’s Paradox, Oscillation and Planning. Archer’s paradox refers to the phenomenon where an arrow does not travel precisely in the direction it is pointed when the bowstring is released. At release, there is a sudden and explosive transfer of energy from the bowstring to the arrow, which causes the shaft to bend, or flex. The relative stiffness - how much it flexes - is referred to as dynamic spine. At the front of this flying arrow shaft is a broadhead, the blades of which act like "wings," causing it to plane. They also exaggerate the effects of arrow flexing and oscillation in flight, which reduces accuracy and increases the time and effort required for tuning. The quicker and more effectively you can control these factors, the more precise and accurate the shot. 5) Arrow rest type and positioning. If only there was an easier way to manage dynamic spine. You can’t alter the laws of physics, and therefore archer’s paradox. However, the engineers at Carbon Express discovered a way to use physics against archer’s paradox. By restricting the dynamic spine flexing to the center of the shaft - the RED ZONE - instead of on the ends (like most arrows), they produced a shaft that oscillates less than other arrows. As a result, the arrow recovers from archer’s paradox oscillation - becomes stable - more quickly and thus produces dramatically improved accuracy, especially when shooting a broadhead. It also de-emphasizes the importance of the other variables. The Maxima® RED™ manages dynamic spine so well, it only requires two spine sizes to match bows from 40-92 pound of draw weight. Broadheads exaggerate the effect of arrow flexing in flight and act like "wings" on the front of the arrow. Managing arrow flex within the RED ZONE of a shaft reduces this effect considerably, resulting in improved broadhead flight. The Maxima RED is extremely forgiving because of the way it’s built. Carbon Express uses proprietary manufacturing techniques, different types of carbon and a new, hi-tech carbon design to build the shaft. Stiffer ends contain the arrow's flex to "RED ZONE"™® when launched and throughout its flight. The process also produces superior spine consistency with matched weight of each arrow in a boxed set. In case the above is not enough to convince you, Maxima RED arrows are also loaded with other features, some of which are already familiar to Carbon Express shooters. LaunchPad Precision Nocks - Designed in concert with development of the Maxima RED, they provide precise contact points for controlled arrow release, an aligned nock barrel for truer arrow flight and have a concentric design to center the nock in the arrow shaft for more consistent performance. Performance Blazer Vanes - Addressing the effects of dynamic spine allows the use of lighter, shorter vanes, which further enhances speed and accuracy. Diamond Weave Finish - The Carbon Express patented outer layer process uses 100 percent diamond weave carbon for improved stiffness and spine consistency. BuffTuff® - This super strong outer finish enhances toughness while reducing friction and noise. BullDog™ Nock Collar - Created with aircraft-grade aluminum, the BullDog nock collar was specifically designed to form-fit over the back end of the arrow shaft to protect it from nock-end impact damage. Tolerance - Carbon Express laser-checks arrow spines and arrow straightness of 0.0001 of an inch to ensure each set meets their rigorous standards. And unlike most manufacturers, Carbon Express straightness tolerances are maximum measurements, not averages. Straightness of +/- 0.0025" Max. 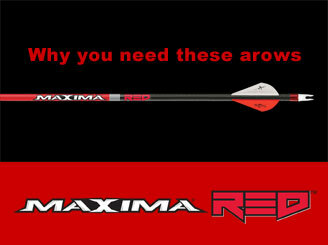 and a weight tolerance of " 1.0 grains place the Maxima RED at the top of its class. When the game is close you need an edge. Carbon Express has figured out a way to manage dynamic arrow spine, confining it to the “RED ZONE,” making their new Maxima RED arrows a real game changer that will help you score big this season.